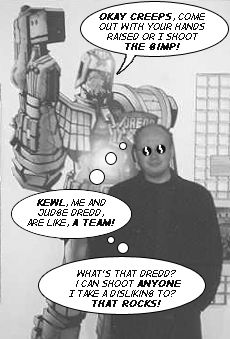 Long time reader of 2000AD (with gaps), still hanging around talking about this stuff, endlessly. Favourite characters and stories are Halo Jones, Judge Dredd, Nemesis, Strontium Dog and Rogue Trooper. Favourite all-time top 3 writers are Pat Mills, Alan Moore and John Wagner. With honourable mentions for Gerry Finlay-Day, Alan Grant and Tom Tully. I currently work as a library assistant, and produce small press comics in my spare time. I produce Solar Wind, an affectionate homage of old British adventure comics from the seventies and eighties. I publish Omnivistascope, my Science Fiction comic from the future.